Created specifically for the AQA A/AS Level English Literature A specification for first teaching from 2015, this enhanced digital resource incorporates differentiated support stretching the more able and supporting those who need it. 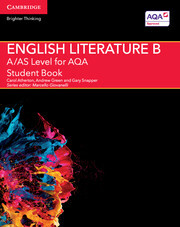 Helping bridge the gap between GCSE and A Level, the three-part structure focuses on texts within a particular time period and supports students in developing skills to interpret texts and reflect on learning, whilst encouraging independent study and wider reading. 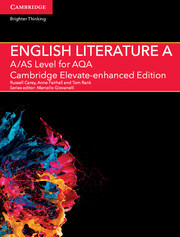 Including digital content, this resource is available online and on tablet devices through the Cambridge Elevate app. The Elevate enhanced edition is fully customisable and interactive, with text that can be annotated, rich and varied video content and auto-marked questions. The Elevate enhanced edition also features a ‘My Work’ folder, enabling students to submit work and teachers to assess effectively, as well as track progress.